Hello sketch lovin' friends! Hope you all had a wonderful Christmas. We had a white one here for the first time in so many years, but the snow didn't stay very long...now we're expecting more today! It might be a good day to stay in and stamp...SNSS has a small release coming next week, so I get to play with some new stamps! Yea! Since it's Saturday, there's also a new sketch at The Sweet Stop and it's one I'll be using again and again! One of the little girls from our church, grew up (Where did those years go? ), went to school in Australia, and came home with a fiancé! So for my sample today, I chose an old favorite stamp set for her wedding shower. Creative Nugget: I love the vintage papers from A Ladies' Diary paper pad by Graphics 45 and thought it would be perfect for a young lady's wedding shower. The papers were matted in black and attached to a Vintage Cream card base. 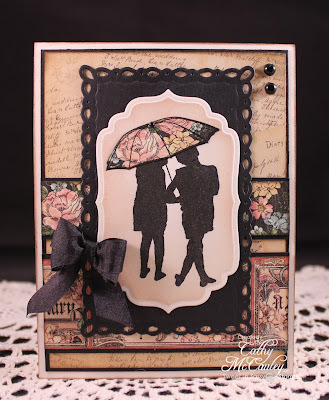 The darling image from Together Silhouettes by Sweet 'n Sassy Stamps was stamped using Versafine Onyx Black ink, the best ink for stamping silhouettes IMHO! The umbrella was paper pieced using the same paper as one of the strips on the background. This was cut with the Labels Four Die, sponged with Tattered Rose Distress Ink, and mounted onto a Romantic Rectangle...how appropriate! A bow and some pearls were added to finish the card! I hope my young friend likes it and you do, too! Be sure to check out the wonderful samples by the other Sugar Babies...I hope you can join us this week at The Sweet Stop! Hello friends and happy Saturday to you! Before I get to this week's sketch from The Sweet Stop, I want to take a moment to thank all of you for visiting with me from time to time and to wish you all a very Merry Christmas! I appreciate so much your very kind and supportive comments and have enjoyed getting to know you better. This Christmas, may the warmth of the Lord's presence bring you joy, peace, and blessings that last throughout the coming year. Creative Nugget: Yes...I'm still making Christmas cards! My plan is to continue with a Christmas version of the sketch each week to begin building my stash for next year. We'll see if I can keep up! LOL! For this sample, Festive papers by Authentique were stitched to Smokey Shadow card stock and mounted to a Soft Stone card base. The candle image, from one of my very favorite Christmas sets by Sweet 'n Sassy Stamps, Christmas Light, was cut with the matching die and colored with Copic Markers. It was then popped up onto Circle Nesties and a Lacey Circle. The sentiments from the Christmas Tags set were hand cut into banners. A couple pearls, Glossy Accents, and Stickes added to the flame, create some texture. For more Christmas eye candy, stop in on the other Sugar Babies. I hope in all the hustle and bustle of the next few days you find some time to play along with us this week at The Sweet Stop! Happy Sunday, friends! I have just a quick card to share with you today created for the Shining the Light Challenge this week at Our Daily Bread Designs. A piece of Turtle Dove paper by KaiserCraft was matted onto scarlet Jewel Card stock and adhered to a Vintage Cream card base. The frame , made from Labels Seventeen Dies, was stamped with the Joy to the World Hymn in Scarlet Jewel after stamping off twice. This was then embossed with the Canvas Impression Plate. The swag from the Gift of God set was stamped three times, colored with Copic Markers and all three were cut out. The ornaments from the Holiday Ornaments 2 set were gold embossed on Vintage Cream and Scarlet Jewel card stock, Cut with the matching dies, and hung from the frame with gold cord. The swags were then popped up on top. And another Christmas card done! Time is running out! Thanks so much for stopping by...have a wonderful week! Hello friends! So glad you decided to tag along today because it is Saturday and time for a new sketch at The Sweet Stop. It's the third week of the month and you know what that means...a spin! The spin is Winter Wonderland, so get out those wintery images and create a tag to go on your creation. One lucky participant will win a $15 gift certificate to the Sweet 'n Sassy Store...just in time for Christmas! Creative Nugget: The inspiration for my card came from the Turtle Dove Paper Pad by KaiserCraft. The children at the bottom of the card are actually part of the DP. Snowflakes were embossed on the top part of the paper, and a kraft knife was used to cut around the tops of the images so the tag could be tucked behind. 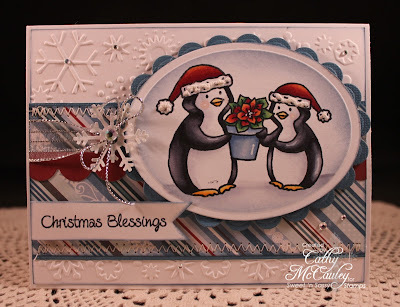 The snowdrifts were made using one of the borders included in the paper pad. The trees and deer are part of the Forest Silhouettes stamp set by Sweet 'n Sassy Stamps, not a Christmas set, but works wonderfully when paired with these papers, to create a wintery Christmas card! Everything was stitched to a Riding Hood Red mat and attached to a Kraft card base. I enjoyed this sketch so much, I used it again to tell you about a brand new stamp set being released today at Sweet 'n Sassy Stamps! Not only is this a fabulous Adoption Set that can be used for so many other occasions, but every purchase will benefit orphans in Henan China! Creative Nugget: Several patterns from the Little Darlings paper collection by Graphics 45...LOVE these baby papers...were stitched to a Kraft mat and attached to a Vintage Cream card base. One of the sentiments from the The Gift of You set was very lightly stamped in Walnut Stain ink several times on the tag. The booties from The Vintage Baby set were lightly stamped on the tag as well. The mother image from Vintage Baby was paper pieced and colored with Copic Markers. A sentiment from the set was stamped on a hand cut banner. 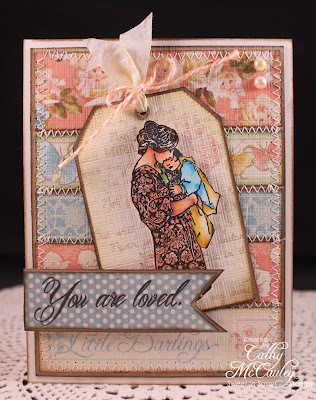 You can see other gorgeous samples using this stamp set on the Sweet 'n Sassy Stamps Blog! The Sweet 'n Sassy Store will begin taking preorders for this wonderful set today! 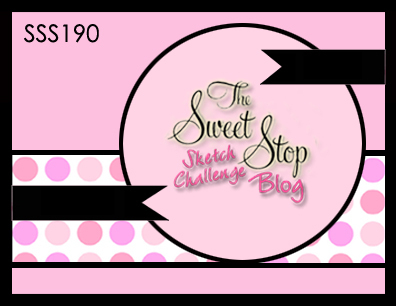 I hope you will tag along and play with us at The Sweet Stop this week...you will love working with this sketch! See what the other Sugar Babies have created for your inspiration! Thanks so much for deciding to tag along, especially at this busy time of the year! Have a wonder filled weekend! Happy Saturday to you, sketch lovin' friends! It's been a BUSY week, but now it's time for a new sketch at The Sweet Stop. This one is perfect for those last minute Christmas cards that need to be finished. Creative Nugget: These adorable penguins from Sweet 'n Sassy's Christmas Penguins clear stamp set were colored with Copic Markers quite a while ago, waiting to be mounted on the perfect card...this was the sketch! A snow marker was used to give texture to the fur on the penguins' hats. I changed the circle to an oval, but other than that, kept true to the sketch design. 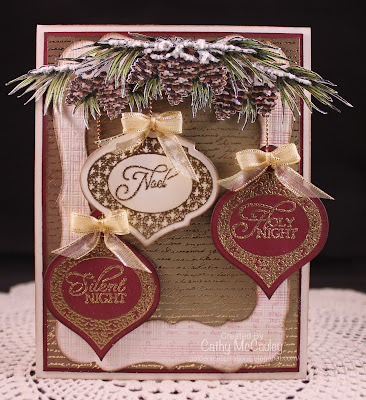 The Winter Park papers by Echo Park and the snowflake embossed panel provided the background for this festive image. A snowflake punch, ribbon, and rhinestone stickers were added before mounting everything to a Neenah Solar White panel. The sentiment from the Cocoa's Christmas clear stamp set was stamped on a hand cut banner and added to the card. And there you have it...quick and easy! I hope you get a change to join us this week over at The Sweet Stop. Be sure to check out the amazing samples by the rest of the Sugar Baby Team! Thanks so much for stopping by...have a wonder filled weekend! 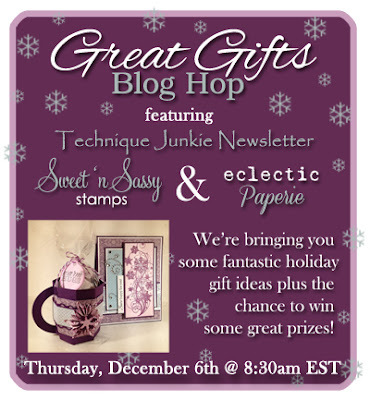 Hello and welcome to the Great Gifts Blog Hop! 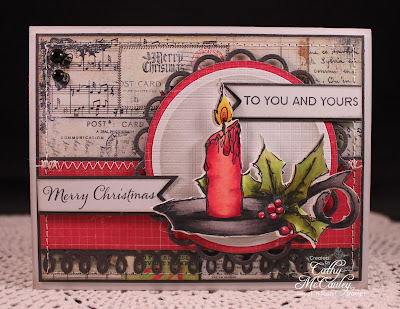 Last year you might remember joining us for the combined blog hop with Sweet 'n Sassy Stamps and Technique Junkies Newsletter. Well now we're adding eclectic Paperie to the mix! This combination is a match made in heaven...fabulous stamps, beautiful papers and accessories, and wonderful gift techniques...and just in time for your Christmas and holiday gift giving! Not only will you get a chance to see some beautiful gifts, but you will have the chance to win some fabulous PRIZES! Each of the companies will be giving away a prize randomly drawn from their designers' blogs. All you need to do to become eligible for one of these prizes is to leave a comment on each blog by midnight EST on Friday, December 7th. The winners will be posted on each company's blog on Sunday, December 9th. So grab a snack, get comfortable and get ready to hop using the Linky Blog Hop Tool at the end of this post! How about a little tea! For my project today, I created a little tea gift set. First, we need some tea! Creative Nugget: This cute Tea Bag Dispenser is one of 40 gifts on the Great Gifts CD by Technique Junkie Newsletter. 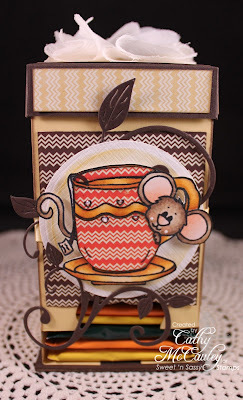 Tea Time Cocoa by Sweet 'n Sassy Stamps was the perfect stamp set for decorating all the projects in my gift ensemble. Cocoa was colored with Copic Markers, cut out, and popped up onto the box. 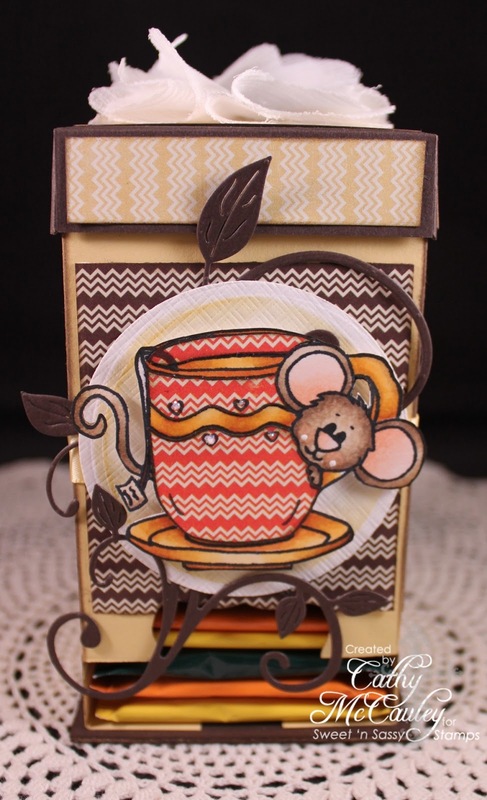 An assortment of items from eclectic Paperie including Papers from the Persnickety paper line by LilyBee Designs and a Maya Road Flower finish off the tea dispenser. Next, we need something to drink from! Creative Nugget: This coffee mug should do the trick! Just the head from Tea Time Cocoa was used to peek out from the flowers created with the Kindness clear stamp set and the matching Kindness Flower Die Set. Other embellishments from eclectic Paperie include a vintage pin and canvas tag from Maya Road, Buttons from Buttons Galore, and Twine from The Twinery. And finally, a gift card to include with the gift! Creative Nugget: Left over papers were layered and stitched to a Neenah Solar Crest card base. 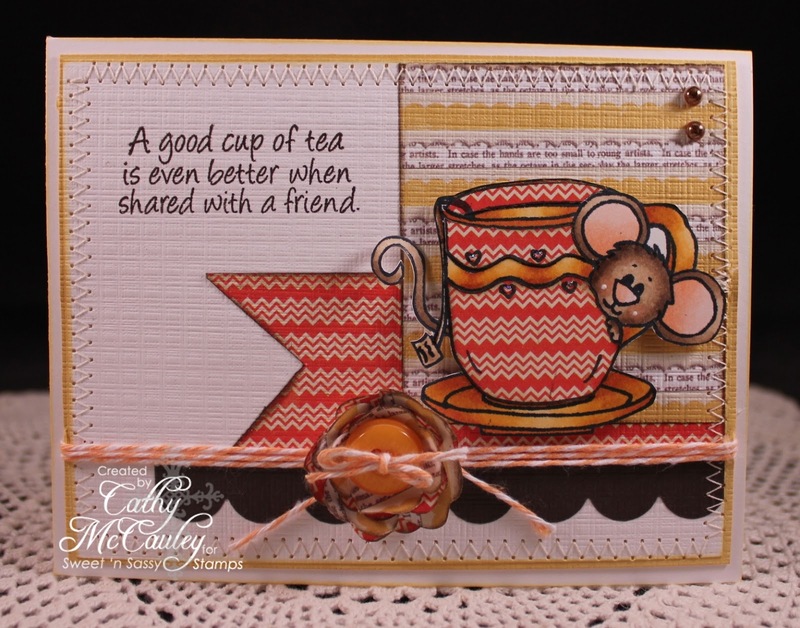 The only additional accessory used on this card was the small Scallop Border Die by Sweet 'n Sassy Stamps. 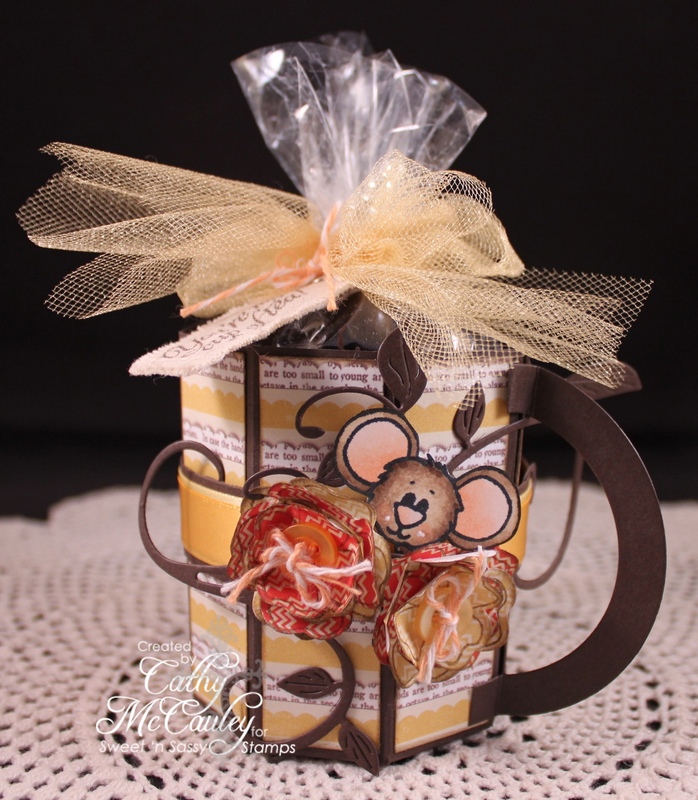 What tea lovin' friend wouldn't love to receive this adorable gift ensemble! As you continue on your way, I'm sure you will get many more fabulous gift giving ideas! Good morning, everyone! Well...now that December is finally here...can you believe it...the crunch is on to get those Christmas cards finished, and even though I've done pretty well on working on mine all year long, I still have quite a few to do...which means that you will probably be seeing a lot of Christmas cards this month for the Sweet Stop Sketch! And here's the first sketch of the month over at The Sweet Stop! Creative Nugget: For some reason I struggled with this one, and even now I'm not sure I like the final product. I could not find a sentiment I liked that would fit the circle element, but it is what it is, and I hope you find something inspirational about it! The music score from the "Joy to the World Hymn," by Our Daily Bread Designs, was lightly stamped using Old Paper Distress Ink on a piece of Vintage Cream card stock. The "Seek Him Still" image, by Sweet 'n Sassy Stamps, was embossed using Fine Detail Gold over the music score. This panel was torn around the edges to mimic the border around the wise men. 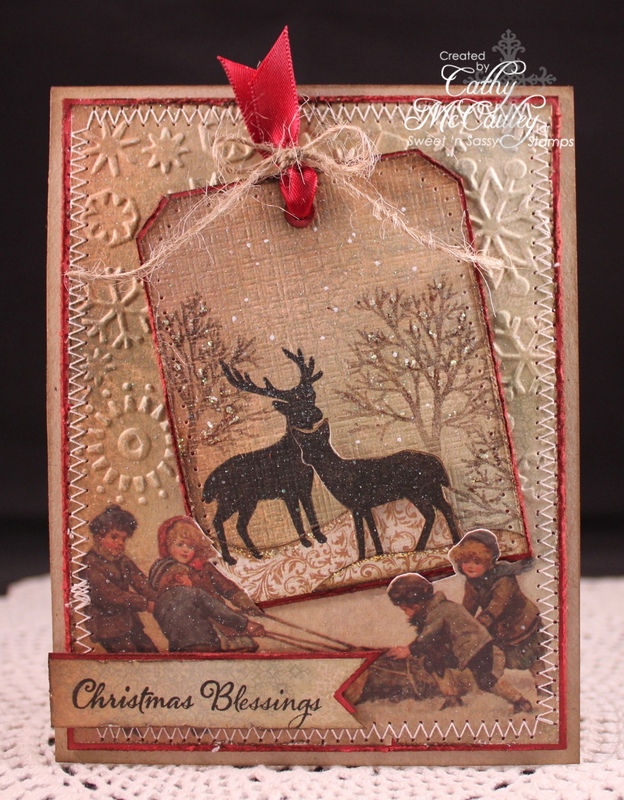 A piece of Twig and Berry DP by KaiserCraft was matted on Scarlet Jewel card stock for the second layer. The Music Score impression plate was used on another piece of Vintage Cream and the edges embossed with gold. A circle punch and Splendid Circle die were used to create the circle element. Everything was mounted on a Scarlet Jewel card base. Gold ribbon and a few gold pearls were added, and now that I'm looking at it again, a few more gold pearls scattered around, may be what is missing to finish the card...Hmmmmm...think I'll go do that now! Even though I struggled with this one, the other Sugar Babies did not, as you will see. Don't forget to check them out and welcome Sephanie Serrano to the Sugar Baby Team before joining us at The Sweet Stop this week! Hope you have a wonderful weekend...thanks so much for stopping by!